Be confident knowing your payment claim will get you paid with compliant Security of Payment and Home Building Act payment claims. Stay on top of your employees, contractors, and projects with tool that help you manage your jobs. Compliant and construction industry specific work health safety systems make compliance simple. Building and construction industry accounting software for your Government and ATO reporting obligations and your profit and loss. Know your profitability and project cost to complete with easy to read graphs and reports. Every type of contract you need to run your job – Home Building Contracts, subcontracts, employee contracts, all in one place. Plus all the project admin notices you need to comply with your contracts. Make every quote a professional quote. Your quotes will meet expectations for high end homes and government tenders. The best thing is you will save tons of time quoting. Small Builders has been built for Australian builders and contractors with less than 50 employees. 1 software for all your needs. We have tailored and automated systems for all types of contracts. Imagine for cost plus systems, making your compliant payment claim with all relevant documents in under 1 minute. It’s powerful, fast, and compliant. Double-handling is a thing of the past. Now the person who knows the answer will only need to write it once. These time saving tools are easy to use and give you powerful data. It does not matter how big your business is, now you can truly operate like a CEO with reports that allow you to effectively manage your business. Small Builders is Australian building and construction software for builders and contractors. The sole purpose of Small Builders is to help you run a sustainable business. Small Builders gets you paid, gets you compliant, and gets you organised. 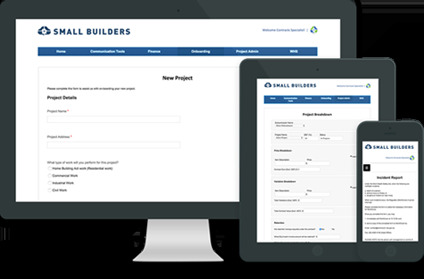 Small Builders software was developed by John Dela Cruz, a building and construction lawyer based in Sydney and a member of the Master Builders Association. Year in and year out, John noticed that small builders and commercial contractors struggled to run sustainable businesses and often lost everything – all because of poor business practices. The Small Builders building software has been built for the needs of home builders and commercial contractors. If you are good on the tools and managing relationships then Small Builders gives you the essentials you need to run a successful business. You don’t need to be good with computers, Small Builders has been built for you – the small business that needs a practical solution - it’s quick and simple to use. The Small Builders’ mission is to grow its clients into giants. GOT QUESTIONS OR NEED A HAND? © 2019 SMALL BUILDERS. ALL RIGHTS RESERVED. POWERED BY SMALL BUILDERS PTY LTD.